In a lot of ways, I almost feel I shouldn’t post this since it calls for an ingredient that is potentially very difficult to obtain. Then again, it might not be, depending on where you live. So what is this ingredient? 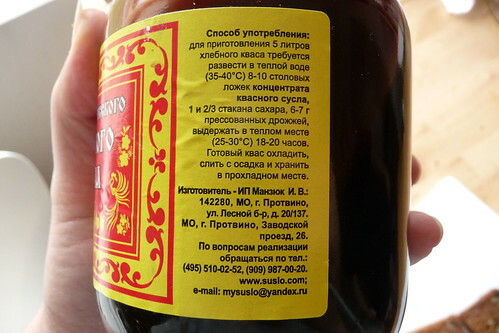 Kvass extract. There are many, many ways to make kvass. My sister (heart, not blood), Lily, gave me a recipe for her version. Latviešu ēdieni has a couple of different ones, as does the Ukrainian book we had. There’s just one problem: for most kvass recipes, dark rye bread is required and it’s extremely expensive where we live. I don’t want to waste good rye bread on kvass that might not come out — plus kvass extract makes it very cheap to make a rather good kvass. The jar we bought will make 25 liters for the price of a 2 liter bottle of kvass! For my American readers, I advise you to find a Russian/Eastern European market. If you live in a large city, this should be no problem. In the Western US, I’ve found that if the market’s name has “European” in it, such as “European Delicatessen”, it’s probably Russian or close to it (think former Soviet republics here). My favorite one in Salt Lake is called “European Tastees” and is run, I believe, by an Armenian family. It’s located on 9th East and Van Winkle in the Ivy Place shopping center. The exact address is: 4700 S 900 E Ste 51, Salt Lake City, Utah. Don’t expect to find much in these markets featuring English translations, so you’ll need to look for “концентрат квасного сусла,” or some variation thereof (or ask for help). 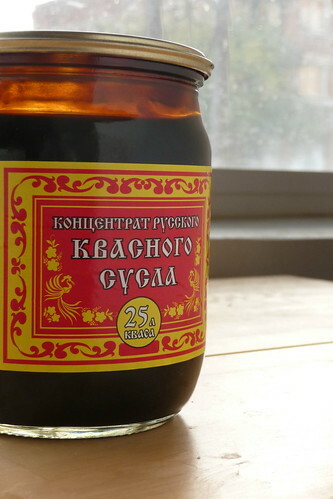 If you’ve never had kvass before, buy a bottle of it before you buy extract so you know what to expect. In Latvia, I remember hearing about a survey that was conducted that found Latvians preferred kvass to Coca-Cola! (I can’t blame them. kvass IS better than Coke!) Making kvass this way does produce a somewhat “yeastier” tasting kvass, but I found once I adjusted to that, I liked it better than the commercial stuff. Beer drinkers should appreciate it, as kvass is somewhat beer-like and somewhat cola-like. Now, on to the extract. If you speak and read Russian, you don’t need my help. Follow the instructions and you’ll get kvass. If you don’t, keep reading. The directions usually want you to make it in 5 liter batches, which we can’t easily accommodate, so we adjusted it down to 3 liters. In a large container, combine all ingredients, stirring well. Loosely cover and find a warm place for it. If you have a gas oven with a pilot light, this is ideal. You need the same warm conditions as you would if you were proofing bread – slightly above room temperature at 75F-80F. Leave it alone for 18 – 20 hours. Carefully pour off the kvass into another pitcher or large bottle, such as a growler, discarding the sedimentary layer at the bottom. Refrigerate for the remainder of the day. This entry was posted in dairy-free, drinks, russian, untranslated. Bookmark the permalink.